People have asked me “Leroy, who was the one man who when you were a child you watched pro wrestling TV shows, you said that’s the guy I wanna be when i grow up?” Well that answer came two-fold and I am going to write a 2 part article on the answer for this. One man was a manager but we will get to that in the next article. But for this article, I’m going to write about my favorite professional wrestler growing up, Mil Mascaras. It might sound crazy but when I was a kid I wanted to be a Luchador! I wanted to go to Lucha Libre school and learn to fly like the amazing Mil Mascaras. Mil Mascaras was probably the most graceful athlete in any venue I had ever witnessed he could fly through the air like no one before him. Mil Máscaras (born Aaron Rodríguez, July 15, 1942) is one of the original “Big Three” (the other two being El Santo and Blue Demon) of the lucha libre tradition in Mexico. He is considered to be one of the most influential wrestlers of all time for enhancing and popularizing the lucha libre style around the world. His brother Dos Caras is as widely well known in the Mexican pro wrestling circuit as him, but it was Mil who came to the WWF and changed what I thought wrestling could be. A lot of kids had baseball or football posters but I used to buy Pro Wrestling magazines as a child just to get his pictures to hang up in my room. I remember listening to sports radio shows hoping that they would give a report on professional wrestling and talk about my hero. He was widely respected in the wrestling world. In a business where allegiances come and go and wrestlers turn face and heel on the drop of a bucket, I can never once remember seeing Mil turn his back on the fans in the 30+ yrs I watched him. He was a classy gentleman in and out of the ring. Some say he had an enormous ego behind the scenes but I’m speaking as a fan of the business and I have never seen anything but class from him. 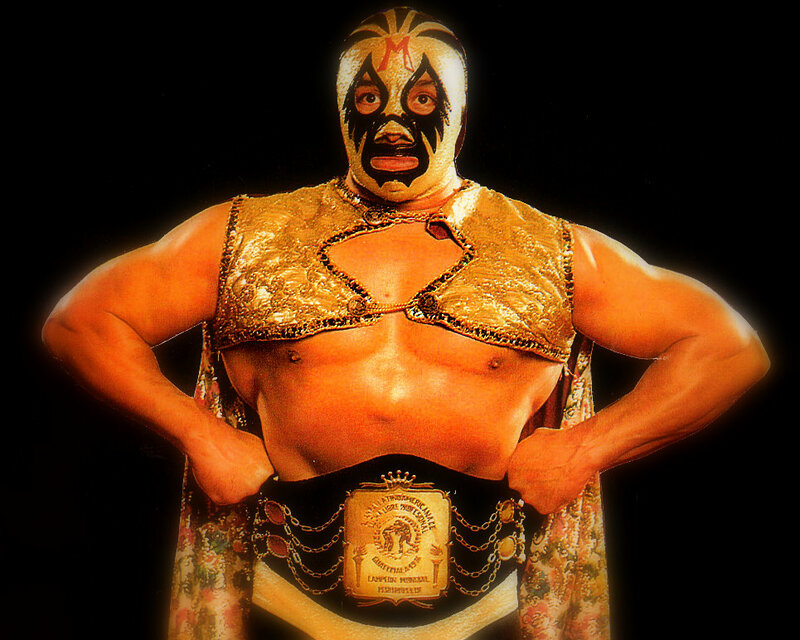 the original Tiger Mask, has described Máscaras’ impact on Japanese professional wrestling, “If it weren’t for Mil Mascaras, there would be no Jushin Liger, no Último Dragón or the Great Sasuke today,”. Mascaras’ success in the U.S. also paved the way for other luchadores such as Rey Mysterio, Jr., who has become one of the most popular luchadores in US wrestling history. One other thing that made him stand out in the wring was the fact that he rarely ever spoke a word. There were no flashy promos, no long interviews, no bad mouthing others—–he just went in the ring and did his thing. He didn’t need all the intimidation factors given by those who scream and holler at the mic—his presence in the ring alone was intimidation enough. He brought fear into the eyes of all his opponents with his sole presence. The other thing that I admire about him was his vast array of masks. Known as the man of 1000 masks, he always came to the ring sporting a different one before unmasking into the Original Mil Mascaras classic mask. He kept his privacy until his death and even outside the ring was never seen without his mask. So there you have it. This Boston kid of mixed ethnic background had a hero who was Mexican, who made me dream of going to Lucha Libre school and learning how to become a Luchador. At six foot five inches tall and nearly three hundred pounds I doubt that I ever would have mastered his high flying moves, but as a pro wrestling manager I still dream of maybe someday managing the next great Lucha Libre star! If you think that you have what it takes to become a Luchador be the next Mil Mascaras then I highly recommend the Pro Wrestling Lucha Libre school in Florida. Part 2 of my article will be about how the greatest manager in my opinion of all time—the Grand Wizard of wrestling—influenced my decision to be a manager. But if it weren’t for Mil mascaras, I probably wouldn’t have the interest I have in the sport today. And for this I thank him. He gave a little boy a super hero to look up to. A standard of goodness and purity in a wrestling world of evil. He is the living breathing definition of legend. About the author: Leroy Jenkins is a freelance professional wrestling manager working shows on the East Coast of the United States. He is currently one of the leading managers of Pro Wrestling Fit USA. Be sure to look him up on facebook or talk with him at the PWF International FB Group. This entry was posted on Saturday, September 21st, 2013 at 2:34 pm and is filed under Lucha Libre, pro wrestlers, pro wrestling, pro wrestling radio shows, pro wrestling school orlando florida, pro wrestling shows, professional wrestlers, professional wrestling. You can follow any responses to this entry through the RSS 2.0 feed. You can leave a response, or trackback from your own site.